In the first person shooter video game Paladins, not only the selection of the right character is important, but also the equipment with the right deck to make the best of any situation. Although it is worthwhile to prepare decks for several situations, there are some evergreens that are always a solid choice. 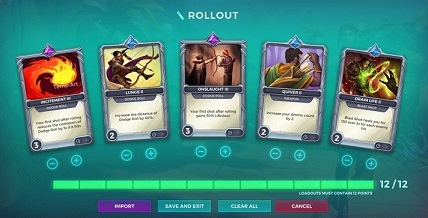 Especially with Cassie, the rollout deck from Echo in the current version OB 41 has proven to be damn powerful. With this deck you play Cassie less like a sniper, but is ready to roll back into the battle. Incitement and lungs harmonize wonderfully: When the first arrow sits after a roll, the cooldown is reduced. With the increased reach of the role, you can move enemies particularly well or escape from dangerous situations. Onslaught grants the first shot after a roll of 30% life jack - in addition to the damage bonus granted by a shot after the roll. The deck is rounded off with additional ammo (Quiver) and Blast Shot (Drain Life), which can also be used to fight battles against several enemies. A perfect combo looks like this: Disengage is an opponent thrown into the air. Immediately afterwards you roll in any direction and then shoot an arrow at the victim, who is still in the air. If you do so, the arrow causes 60% more damage and the next roll is almost instantly ready again. Echo recommends training against bots or practice for a while, until you have internalized at least 80% of the shots after a roll. Only then you can profit from all bonuses and can move many enemies with two or three targeted hits into the digital beyond.